Oregonians for Food and Shelter Legislative Review 1/11/19. Bans neonicotinoids, aerial pesticide prohibition, forest practice bans, dairy size prohibitions and regulations, Articles: Carbon Cap, Wolf talks, Klamath Refuge Management Attacks, Walden townhalls. USFWS releases water from the refuge, H&N, 3/29/18. Lower Klamath Refuge construction an effort to save salmon (on the Columbia River). Habitat restoration aimed at dispersing (fish eating) Caspian Tern populations, H&N 2/14/18. "...According to Beckstrand, the Caspian tern population along the Columbia River has been responsible for around 15 million to 20 million salmon smolts being eaten annually. The cormorant population growing on East Sand Island is estimated to be responsible for an additional 11 million young salmon each year..."
* Lower Klamath Wildlife Refuge - Floating Islands Enhance Salmonid Recovery by Creating Alternative Nesting Habitat for Caspian Terns, US Army Corp of Engineers, US Fish and Wildlife Service, and NOAA Fisheries plan succeeded, with OSU and USGS, to bring fish predators to Klamath Basin. Floating Island International 2010, posted to KBC 6/13/13. "In February 2010, FIW and Just Buckets built and launched a 40,000sq. ft. floating island at Sheepy Lake in Lower Klamath National Wildlife Refuge." (The fish-predator Caspian Terns population in 2010 went from 0 to 325 in 3 months on Lower Klamath.) "This innovative island has been a tremendous success, as the Sheepy Lake tern colony appears to have had the highest nesting success of any Caspian tern colony in the region during 2010." 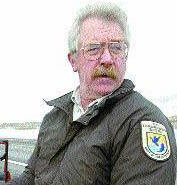 * Restoring refuges - Wildlife refuges benefit from stimulus funds, H&N, posted 10/16/09. RELATED ARTICLE: Stimulus funds bring Caspian tern project to Siskiyou County, Siskyou Daily News 8/12/09. "...the Tulelake reserve rock island’s cost is approximately $1.1 million, the Orems unit rock island’s cost is approximately $650,000 and the Sheepy Lake floating island’s cost is approximately $2.3 million...an estimated colony of 10,000 nesting pairs of Caspian terns on Rice Island in the Columbia River were consuming approximately 6 million to 25 million salmonid smolts per year, according to a 1999 USACE report." Irrigators file lawsuit over Klamath refuge restrictions, H&N from Capital Press 4/13/17. "The Tulelake Irrigation District, Klamath Water Users Association, Tulelake Growers Association and three private farms have now filed a complaint against the agency, arguing that plans for the Tule Lake and Lower Klamath refuges violate federal laws." * All Chapters and attachments, summary. * Tule Lake was a navigable lake up to 30' deep in a closed basin. There was no outlet for this water. To farm the land, and provide water for affordable regulated hydropower for the West, at the farmers' expense, we rerouted that water and blasted a tunnel through Sheepy Ridge so 20-30 acre feet of that water would go into FWS Lower Klamath /Wildlife Refuge, where it could never go before, then into the Klamath River. Tulelake Irrigation District pays for 100% of the Operations and Maintenance of D Plant (the electric pumps pumping that water uphill through the tunnel) and Lease Land farmers pay for 98% of that cost. HERE is a Power Usage & Cost comparison. Our power costs have increased 2729% in 7 years. RESCUE in the REFUGE, Botulism outbreak: 100 birds a day found ill or dead, and KBC NEWS commentary, Herald and News 8/31/14. "According to Greg Addington, executive director of the Klamath Water Users Association, in the KBRA, a block of water is allocated for the Klamath Project and for the Klamath refuge complex...All the problems we’re seeing in the community related to water can be resolved with the Klamath Settlement Agreements...” Part of Commentary: "Take, for example, the Klamath Basin National Wildlife Refuge. The complex has been perpetually short on water in recent years and a jump in power costs in 2004 has made pumping water to replenish wetlands prohibitively expensive....(Manager Ron Cole) estimates that in 2001 it cost 33 cents to pump an acre-foot of water onto the refuge. The cost to do the same to day is $9.20. Klamath Basin - Lack of bird refuges plan spurs lawsuit, H&N 4/25/14. Tribe seeks protection for refuges; Modoc Nation members want to halt water removal, H&N, posted to KBC 3/16/14. “The Modoc Nation respectfully requests the U.S. Congress, Department of the Interior, the Bureau of Land Management and the U.S. Fish and Wildlife stop all pumping and irrigating off the sacred water in this refuge complex" KBC NOTE: The Modoc Tribe, recently branched off from the Klamath Tribe in 2010. The Klamath Tribe in the KBRA agreed with the Congressional right of irrigators to farm the FWS refuge leases. The Modoc Tribe requests all water to be used for their sacred endangered suckers. FWS has built two islands in these refuges which are successfully attracting fish parasites, Caspian Terns, which eat baby fish and keep the species endangered. Comments due 2/21/14 on more relocation of Columbia Basin fish predators Caspian Terns, which were relocated to Tule Lake and Klamath refuges. Hunting improves on bird refuges, H&N, posted to KBC 11/17/13. "A flyover on Nov. 1, conducted by Jim Hainline for the USFWS, revealed nearly 100,000 birds are currently in the refuge..."
Nine Wildlife Organizations Urge Wyden to Act on Klamath Refuges, Oregon Wild Press Release, posted to KBC 7/3/13. 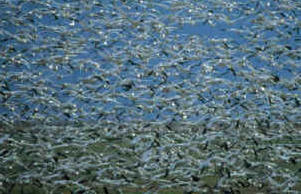 KBC NOTE: Tulelake Refuges have an abundance of water presently. Cole explains below why irrigators can't pay to pump into LKNWR. Klamath Basin Fish and Wildlife / FWS refuge manager Ron Cole's letter rallying Audubon Society to petition Obama administration to obtain a water right. He did say the REASON for the low flows: "Mandated ESA flows in the Klamath River and water levels in Upper Klamath Lake have reduced water allocations to the Project. Escalating power costs mean these limited supplies of water are too expensive for irrigators to pay pumping costs, causing them to reuse water many more times, rather than send return flow to LKNWR. From 1981- 2009, LKNWR averaged about 74K ac.ft. of return flow delivered through D-Plant. From 2009-2011, return flow has averaged about 15K ac.ft., a reduction of about 80%." Solution: Fish and Wildlife Service could pay the power cost and have full water deliveries. Cole details a solution: Geothermal energy plant planned for Klamath wildlife refuge, SBO, posted to KBC 3/29/12. "Take, for example, the Klamath Basin National Wildlife Refuge. The complex has been perpetually short on water in recent years and a jump in power costs in 2004 has made pumping water to replenish wetlands prohibitively expensive....(Manager Ron Cole) estimates that in 2001 it cost 33 cents to pump an acre-foot of water onto the refuge. The cost to do the same to day is $9.20. 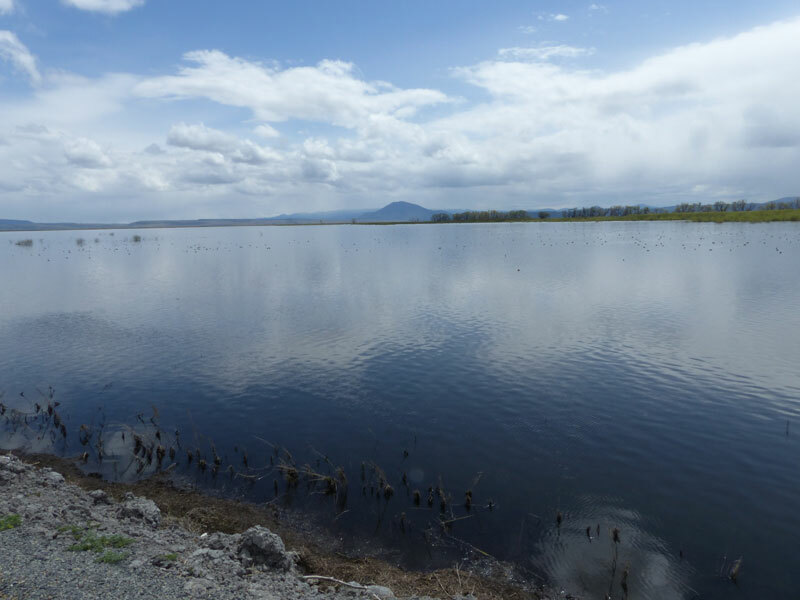 Lower Klamath Wildlife Refuge - Floating Islands Enhance Salmonid Recovery by Creating Alternative Nesting Habitat for Caspian Terns, US Army Corp of Engineers, US Fish and Wildlife Service, and NOAA Fisheries plan succeeded, with OSU and USGS, to bring fish predators to Klamath Basin. Floating Island International 2010, posted to KBC 6/13/13. "In February 2010, FIW and Just Buckets built and launched a 40,000sq. ft. floating island at Sheepy Lake in Lower Klamath National Wildlife Refuge." (The fish-predator Caspian Terns population in 2010 went from 0 to 325 in 3 months on Lower Klamath.) "This innovative island has been a tremendous success, as the Sheepy Lake tern colony appears to have had the highest nesting success of any Caspian tern colony in the region during 2010." Photo: A new two-acre island for Caspian terns, shown before it was flooded, was built at the Tule Lake National Wildlife Refuge. 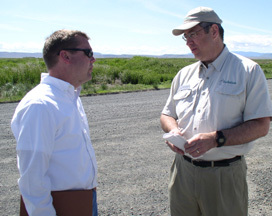 Restoring refuges - Wildlife refuges benefit from stimulus funds, H&N, posted 10/16/09. Oregon Senator Doug Whitsett 6/13/13 Newsletter: Thousands of fish-eating Cormorants eating baby suckers? Water for the refuges: Spring diversions to the refuge are helping to attract wildlife, H&N, posted to KBC 7/10/12. KBC EDITOR: As we understand it, the refuges have lowest water priority. Historically this farmland was not without water; it was a huge navigable lake. So when our government allows our farms to have their deeded water, all the runoff goes into the refuges, then into the Klamath river. We pump our water out of the basin, diverting it uphill through a man-made tunnel into refuges then into the Klamath River, all at Klamath Project irrigators' expense, where it historically could not be diverted. Our NMFS biological opinion presently does not allow the lake to fill. When it reaches a certain level the BO mandates the water to go down the river, or in the case this year, directly from the lake into the refuges. This has created a shortage for the farmers, so money is being paid to farmers to fallow land, pump groundwater, or irrigate like crazy early so at certain dates they use no more water and get paid for not irrigating later in the year. When water goes directly to refuges that runoff does not go to the farms. Last winter, since our power rate has increased more than 2000%, farmers could not afford to pump the water as much as before, and normally Fish and Wildlife is not willing to pay for this water, from a historic close basin, to be pumped to benefit fish and wildlife. HERE for Klamath Basin Refuge Page and related articles. 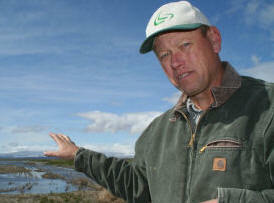 (Klamath Basin) Farmland lease bids hit new record, H&N 4/26/12. KBC NEWS editor: There have been dozens of articles blaming irrigators for recent bird deaths on our wildlife refuges. Read Klamath Basin Fish and Wildlife / FWS refuge manager Ron Cole's letter rallying Audubon Society to petition Obama administration to obtain a water right. He did say the REASON for the low flows: "Mandated ESA flows in the Klamath River and water levels in Upper Klamath Lake have reduced water allocations to the Project. Escalating power costs mean these limited supplies of water are too expensive for irrigators to pay pumping costs, causing them to reuse water many more times, rather than send return flow to LKNWR. From 1981- 2009, LKNWR averaged about 74K ac.ft. of return flow delivered through D-Plant. From 2009-2011, return flow has averaged about 15K ac.ft., a reduction of about 80%." 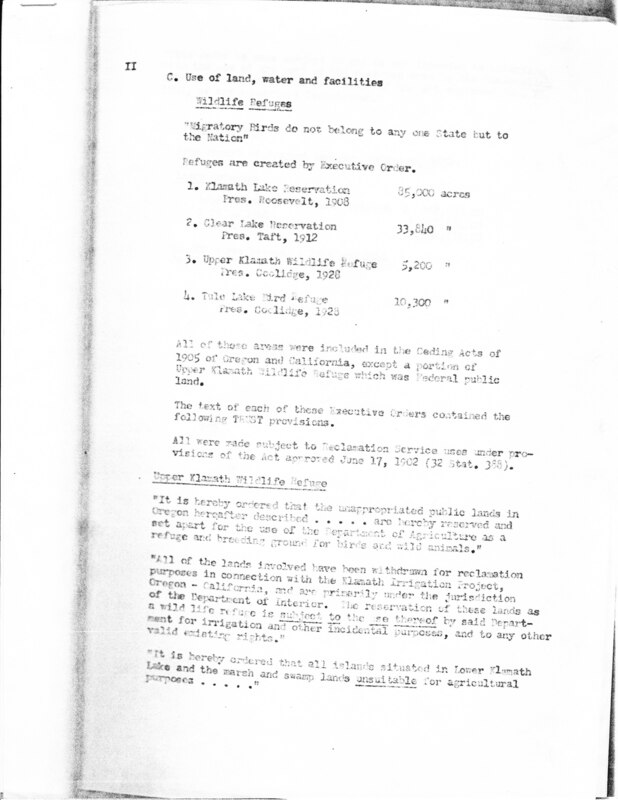 KBC - Tule Lake was a closed basin, and the water historically had NO WAY to reach Lower Klamath / LK or Klamath River. To grow food, farmers rerouted the water, blasted a tunnel in Sheepy Ridge to put water into LK and the River. The farmers PAY TOTAL PUMPING COSTS. FWS refuses to pay to receive this water. Since the tribes and enviro groups sued to force our power rates to raise more than 2000%, we can not afford to pump and divert water into the refuges entirely at our expense. Part of the KBRA blackmail is, groups sued to raise our power rate, so if we agree to their KBRA, FWS might contribute to the cost of pumping this water out of the Tule Lake basin. The following is one example of KBRA spinning bird cholera to gather support for the KBRA / dam removal deal. Sustainable NW is a voting member of the KBRA. Klamath bird crisis just one more avoidable tragedy if we pass water-sharing agreements, by Martin Goebel, Oregonian OpEd April 16, 2012. Martin Goebel is the president of Sustainable Northwest in Portland. Writer Toni Thayer writes on KBC discussion forum: SNW "founder and president, Martin Goebel, has previous ties to The Nature Conservancy and World Wildlife Fund. Goebel is a trustee of the Summit Charitable Foundation which has assets of nearly $75 million. This foundation belongs to the Mormon Roger Sant and his money from Applied Energy Services Corp, AES, “worldwide developer of power projects”, “a global power company operating in 29 countries”. Most of the power for global AES comes from “unsustainable” and “non-renewable” coal and natural gas. But, hey, that’s OK if his donation money comes from dirty industries, just as long as it keeps coming, right? That dirty money, no doubt, pays your dirty salary...I wonder if he/his foundation/his global power company could have a conflict of interest related to power generated by those “renewable” Klamath dams they want removed?" See KBC's Whose Who page. ESA partially to blame for bird kill at refuges, Debbie Kliewer, H&N letter 4/7/12. Water requested for refuges, 26 groups sign letter to Secretary Salazar to bring more water to wildlife refuges, Siskiyou Daily 3/30/12. “USFWS does not pay to pump the water through the mountain. Tulelake irrigators pay the entire cost, hundreds of thousands of dollars in power bills... if farms receive water, the (Tule Lake) refuge receives water...Buying-out water rights will dewater fields. Dewatering fields means that neighboring fields must use more water to irrigate. As we learned from the water shutoff in 2001, when fields and ditches go dry, our aquifer’s water level drops significantly...(KWUA director) Addington, whose group supports the Klamath settlement agreements that are part of the proposal to remove four dams on the river, said if those agreements were implemented their provisions would alleviate this problem." KBC editor: If the KBRA were in effect, according to KWAPA/Klamath Water and Power Agency director Holly Cannon, "What you're giving up is water to get affordable power...20-25%." When ask what the power rate will be, or if it will be lower than tariff rate, Cannon said, "We can't guarantee it." So Addington is partly correct because the KBRA does buy out water rights and downsize agriculture. However, when ag water is put into wetlands, it evaporates twice the water as used by intermittent sprinkling of crops, so it will not produce more water. Since tribes and environmental groups sued to multiply our power rate over 2000% and won, farmers are no longer able to afford power to pump water out of our closed basin as often into LK, water that historically never left the Tulelake basin. The blackmail of the KBRA was, if farm leaders sign onto the dam removal deal, those tribes and environmental groups (voting KBRA members) would agree to allow farmers an affordable power rate, and the feds would pay some of the costs to pump the water out of the closed basin into Lower Klamath refuge and Klamath River. 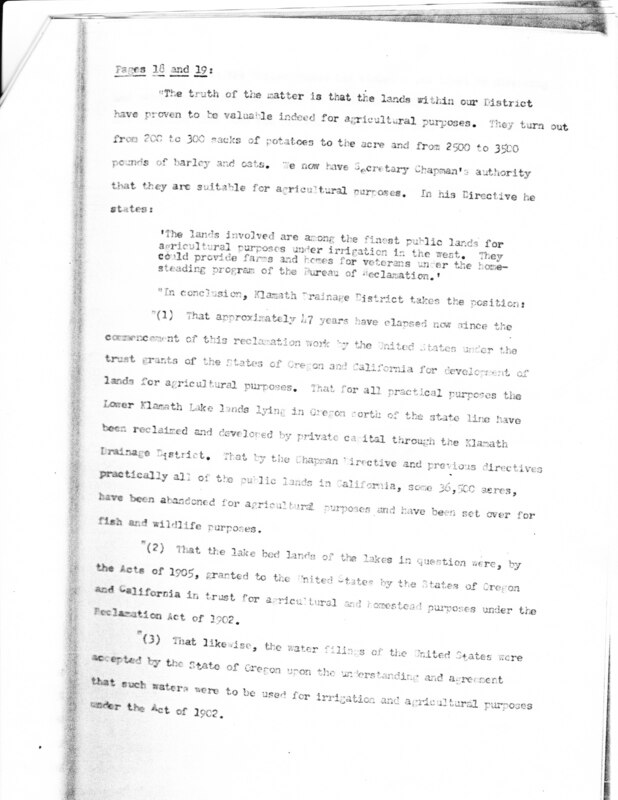 Leave it alone, H&N letter by Henry Christiansen, past Tulelake refuge manager 9/8/04, regarding Rep Earl Blumenauer's persistence in trying to eliminate refuge farming, "...it would take 162,800 acre-feet more water to flood the farm area than it takes to farm it. At present, that amount of water isn't available and there isn't anything indicating it will ever be available." Ron's letter prompted Center for Biological Diversity and a coalition of other environmental groups to write letter to Interior Secretary Salazar suggesting the feds buy out farmer's water rights 3/27/12. 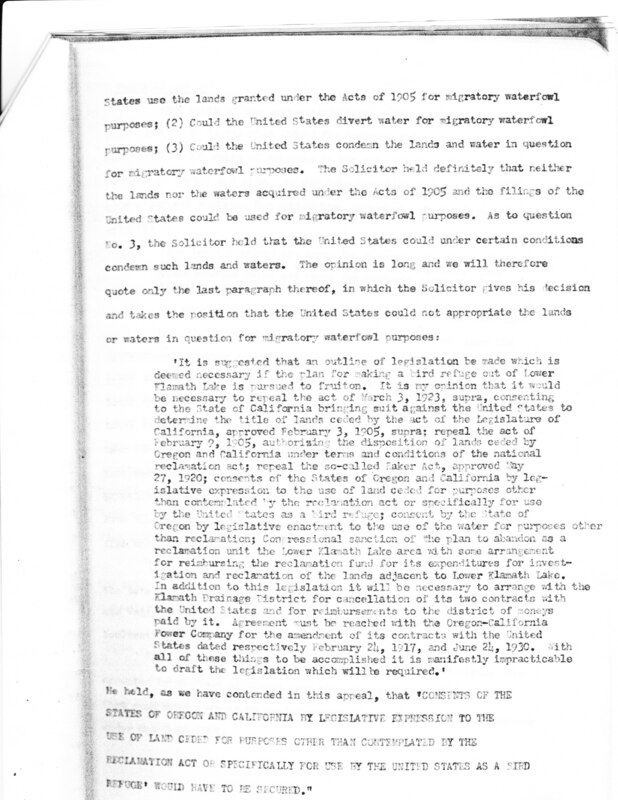 "The Department of the Interior and Congress should work together to develop a voluntary demand reduction program, where private water right holders can retire their claims to water..."
"To make matters worse, these commercially leased agricultural fields regularly receive water even in years when the refuge’s wetlands are, in stark contrast, left totally dry." KBC EDITOR: Check out these KBC photos below from fall 2010. Photo to left is dry dead fields. 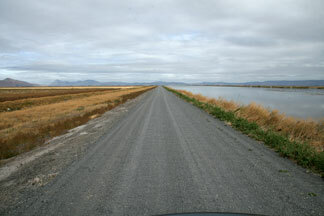 Center photo is farm leaseland on left and Tule Lake wildlife refuge on right. 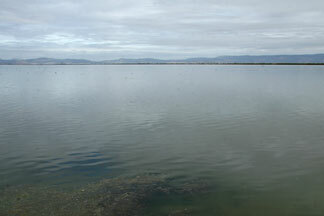 Photo on right is full Tule Lake. KWUA newsletter regarding Buying out Irrigators 5/11/04 by director Dan Keppen, when environmental groups and USFWS promoted it before. Geothermal energy plant planned for Klamath wildlife refuge, SBO, posted to KBC 3/29/12. "Take, for example, the Klamath Basin National Wildlife Refuge. The complex has been perpetually short on water in recent years and a jump in power costs in 2004 has made pumping water to replenish wetlands prohibitively expensive....(Manager Ron Cole) estimates that in 2001 it cost 33 cents to pump an acre-foot of water onto the refuge. The cost to do the same to day is $9.20. 26 Organizations Sound Alarm on Klamath Water, Obama Administration Urged Not to Allow National Wildlife Refuges to Go Dry, Center for Biological Diversity Press Release, posted to KBC 3/29/12. Energy site work could begin later this year, Geothermal facility on refuge considered, H&N, posted to KBC 3/1/12. "Depending on volumes produced by the geothermal wells, Cole said the refuge complex could meet all or part of those power needs and provide water to parched wetlands." 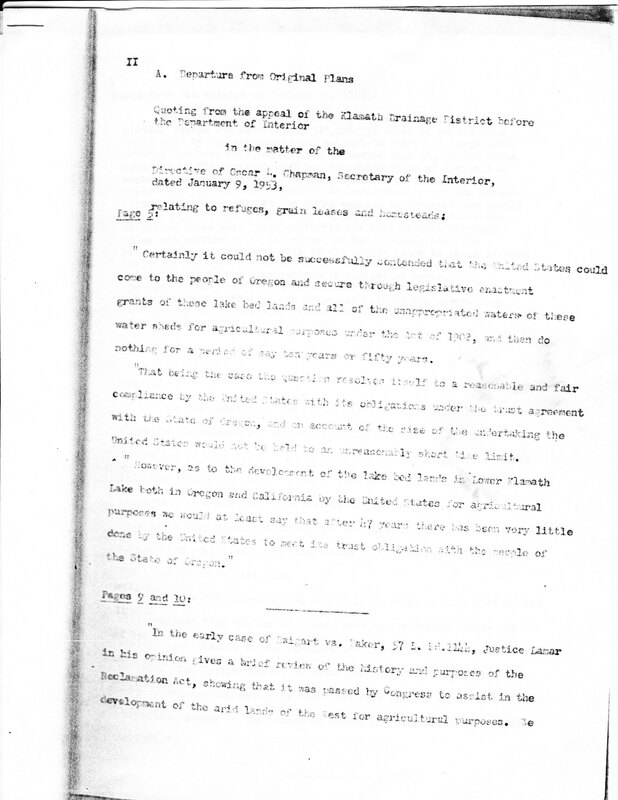 (U.S. Fish and Wildlife service) 'Wish list' for suckers nails farms, H&N by Todd Kepple, "Reconverting 41,000 acres of prime farmland in the Klamath Basin to marshes and wetlands is high on a list of priorities in a proposed $50 million government plan (USFWS) to protest two endangered species of sucker fish. The plan was outlined in a congressional budget proposal drafted by the U.S. Fish and Wildlife Service's Sacramento field office." 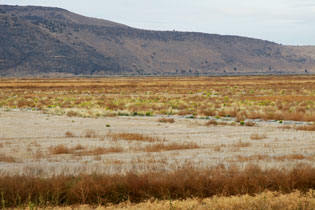 HERE for photos of Tulelake refuge one year ago, October 2010 compliments of KBC News. "There are (489) species of wildlife here in the Klamath Basin. The biological opinion deals with three." Ph. D. Robert McLandress, UC Davis ecology. Here in the Pacific Flyway, "...Klamath Basin is the most important waterfowl area in North America. Waterfowl eat 70 million pounds of food here, and more than half comes from the farms. Pacific Coast Federation of Fishermen / PCFFA, American Rivers, Trout Unlimited, Institute for Fisheries Resources (spinoff of PCFFA), North Coast Environmental Center, Klamath Riverkeeper, Oregon Wild, Klamath Forest Alliance, Water Watch, Earthjustice, VISION statement: "Commercial agriculture within the refuges should be phased out (Klamath Coalition link) in an equitable manner and the refuge lands should be returned to a natural habitat condition...Crops planted on the refuge lands such as onions, sugar beets and potatoes, which are of little or no value to wildlife and require particularly toxic pesticides, should be eliminated expeditiously." 5 of those groups listed are "stakeholders" in the Klamath Basin Restoration Agreement which states they support refuge farming. Huh??? Earthjustice provides free legal services for most of the above enviro groups, partly funded by George Soros. Refuge employee (Dave Mauser) honored, biologist earns national award for wetlands program, H&N 3/18/11.“I think this award was not for perseverance but for the work I and a lot of others have done with the Walking Wetlands program,” he said, referring to the crop rotation program. In some years, the Walking Wetlands program has added upward of 10,000 acres of wetlands and spurred expansion of organic farming." HERE for more on refuges, and FWS intentions of land and water rights acquisitions. PUBLIC NOTICE - Tulelake National Wildlife Refuge Cooperative Farming, February 2011. KBC Note: 979 acres of private land will become seasonal wetlands, and growers will be provided land to farm in the wildlife refuge. Our federal government pays farmers to use efficient sprinklers, yet they want 979 acres of private land to have standing water much of the year. From Klamath Drainage District appeal before Dept. 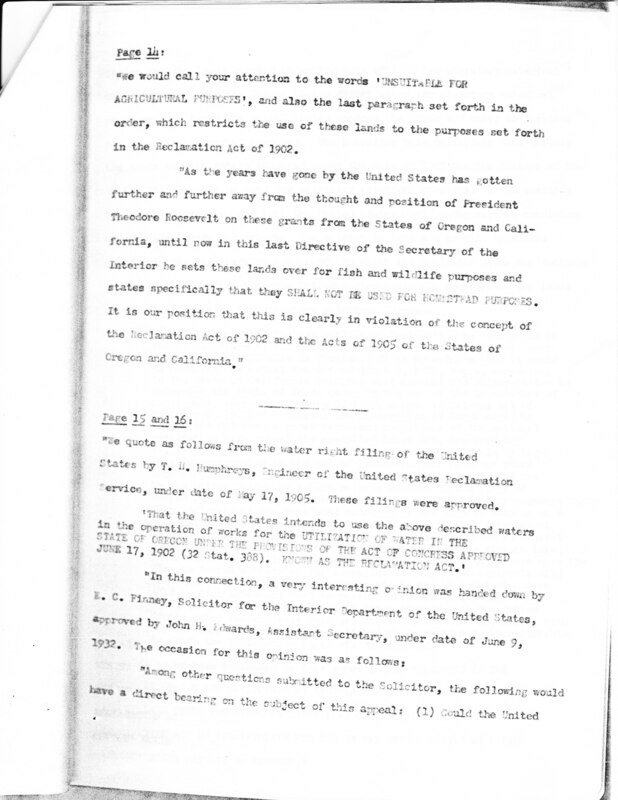 of Interior 1953 relating to refuges, grain leases and homesteads, Reclamation Act, purpose of the Klamath Reclamation Project, and attempts by the federal government to change that purpose. 3/2/11 - Conserving the Future: Wildlife Refuges and the Next Generation, Draft Vision, 2011. Covers land acquisitions, farming, acquiring water rights, managing land outside the refuge, climate change, ... Draft Vision information page. Draft Recommendations. PRESS RELEASE: Salazar draft vision for future of refuges 2/24/11, "Spanning more than 150 million acres of land and water..."
The KBRA/Klamath Basin Restoration Agreement 15.1.3 changes the purpose of the Klamath Reclamation Project. Continue reading KBRA document regarding the new water right given to Fish and Wildlife Service. TuleLake Refuge farmland Oct. 2010. No water. No crops. Noxious weeds. Waterfowl normally eat 70 million ponds of food here, 1/2 coming from the farms. TuleLake Refuge lake for birds Oct. 2010. Presently FWS has no water right on the refuge; when farms get water, then the refuge gets all that runoff; both win, farmers and wildlife. This year was different. Why?
" 'Fall birds will migrate until the beginning of November. With no water, the birds will have to go someplace else..We’re running out of places for birds to go,' Mauser said. 'Endangered species and tribal trust obligations come first, then farmers, and then what’s left over goes to the refuges.'" 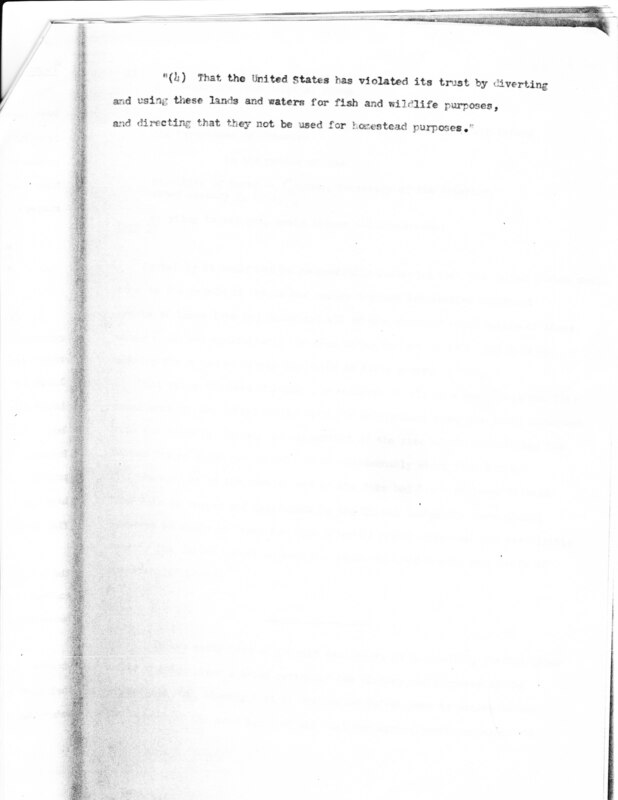 Letter from Bureau of Reclamation Susan Fry to Ron Cole, Fish and Wildlife Tulelake Refuge Manager, regarding FWS takeover of leaseland management, posted 7/23/10. "Ron, I understand you held a meeting with Lease Land growers on July 14th and announced that FWS had “fired the Bureau” and would be taking over the lease land program. Since I have not heard from you regarding the lease land program since April/May, I am surprised to hear of this announcement..."
Farming For Wildlife, The Nature Conservancy, 2009. "This grant will sponsor an informational trip by some of the participating farmers and other agricultural stakeholders in the Skagit Delta to Tule Lake National Wildlife Refuge in the Klamath Basin region of Northern California." Refuges receive stimulus money, H&N 5/19/09. "The stimulus money will be used to create a block of 1,300 acres that will be flooded for two years this fall. In 2010, the land will be returned to crops for three to five years." (Klamath Basin) Walking Wetlands, Iowa Public Television, posted to KBC 5/19/09. Tulelake refuge manager Ron Cole, and Tule Lake farmers Marshall Staunton and Rob Crawford, tell about the Walking Wetland program. Bird hunters flock to Klamath Basin; Farms offer critical food source for migrating waterfowl, Capital Press by Jacqui Krizo 11/9/07. "...the Klamath farmers are crucial to waterfowl. If farms are healthy, the waterfowl can serve people up and down the Pacific Flyway. 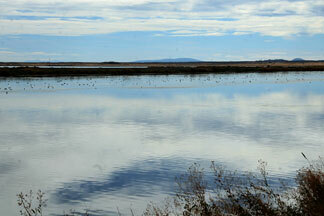 Klamath Basin has the largest concentration of waterfowl in North America," . Growing crops and ducks, Integrating wetlands into commercial crop rotation in the basin, Pioneer Press, posted to KBC 8/17/07, followed by Compromise, and Environmental Groups. Dry year may work in irrigators’ favor, H&N, posted to KBC 6/27/07. "Wildlife refuges may also get more water"
US Fish and Wildlife stole $60 million dollars POLITICAL BEDTIME STORY (FOR HUNTERS, FISHERMEN, TRAPPERS & OTHER NEOPHYTES) by Jim Beers 12/30/06. "Jim Beers is a retired US Fish & Wildlife Service Wildlife Biologist, Special Agent, Refuge Manager, Wetlands Biologist, and Congressional Fellow. Walking Wetlands Program participant Marshall Staunton shows land that is currently being flooded for wetlands at the Tule Lake National Wildlife Refuge. This land will eventually be planted with an agricultural crop. Mild winter brings early birds to Klamath refuges, H&N posted to KBC 3/10/05. (When the government mandates taking over 1/3 of our area's irrigation water this year, which is designed to end up in the refuges, it affects these 594,000 birds. Single species management of illegally-listed coho salmon, and tens of thousands of listed sucker fish, is destroying the rest of our ecosystem and economy.) For more local wildlife, go HERE. Refuge managers, farmers, find common interest, Herald and News 11/1/04, by Jacqui Krizo. "Remember, this biological opinion was created from the agenda-driven Hardy studies. Dr. Thomas Hardy of Utah State University was hired by the Department of Justice and Bureau of Indian Affairs to go against the farmers in the water adjudication litigation." Refuge report earns an "F", Klamath Courier 10/20/04. "Wildlife and agriculture sharing the land can be spectacular and burdensome." Story by Klamath Basin Farmer Steve Kandra. Photos © Larry Turner. During spring and autumn migrations, millions of snow geese forage on private fields along the Oregon-California border. Media Advisory by Klamath Water Users Association: Defenders of Wildlife Refuge Report Misses Mark 10/8/04. Note from Klamath Water Users Association regarding our refuges 10/7/04: "Earlier this year, the Oregon Natural Resources Council, WaterWatch of Oregon, and other long-time critics of family farms and ranches, released a report entitled “Refuges in Peril", which portrayed Klamath national wildlife refuges. While at the same time Klamath Project irrigators and federal agencies greeted the recent release of the 2004 Klamath Project operations plan with a sense of renewed optimism, these farming critics were already forecasting doom for the region’s national wildlife refuges." As usual, the doom and gloom prediction proved wrong. The Tule Lake and Lower Klamath national wildlife refuges are wetter than they have been for years, federal officials said this week. "Some people are telling me that this is as good as it looked five years ago," said Ron Cole, refuges manager. "It is certainly a change from when I got here a year ago." 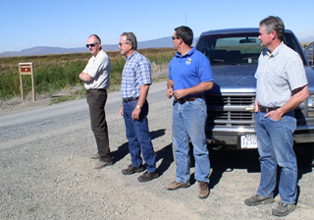 What do Klamath Basin wildlife refuge managers and farmers have in common? And Organic Farming is on the Rise, KBC September 25, 2004. 1. 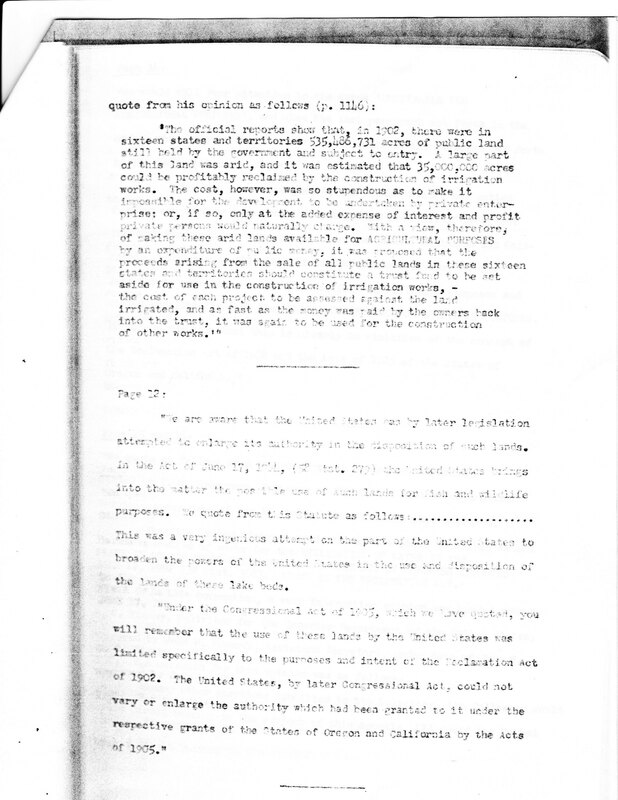 KWUA’s comments sent earlier this summer regarding "Scoping Document No. 1" prepared by FERC in compliance with the National Environmental Policy Act ("NEPA"). This should provide you with the additional detail you requested regarding our stance on, and related history of, the current power rate enjoyed by Klamath Project irrigators. 2. Description of pre-Project hydrology, relative to downstream flows in the Klamath River. 3. Description of Klamath Project efficiency. 4. Summary of cropping patterns and irrigation. 5. 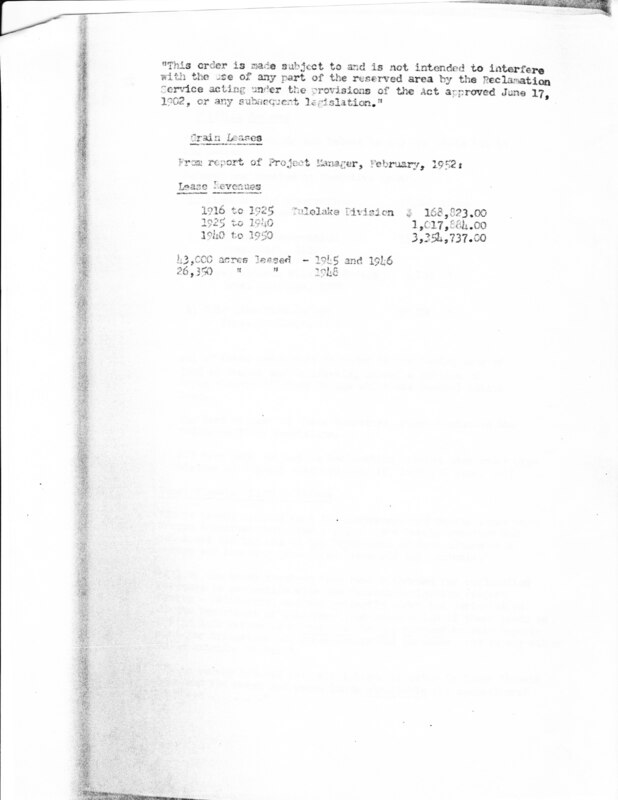 Summary of March-October diversions, 1962-2001. 6. Summary of refuge water demands, 1951-2001. Congressman Blumenauer's response to a H&N editorial, Failure to deal with Basin problems the real threat in H&N posted to KBC 9/5/04. (Farms use less than half the water than wetlands. In the past 10 years, over 92,000 acres of farmland have been converted to wetlands,--go HERE for documentation--. He feels taking 1/10th of our land out of production will help Oregon, the state that sports the highest unemployment in America. Our agriculture contributes 200 million dollars into the economy and employs thousands of workers. KBC) HIs article is after the article that he responded to:: Congressman's words conflict with each other, H&N 8/31/04, "So, the question for Blumenauer is this: Which is it? Is the route to a resolution through local bargaining? Or is it through a decision in Washington to take the most productive tenth of the Klamath Reclamation Project out of crops and start Basin agriculture into a death spiral?" Letter to Klamath Basin farmers from Jim Beers in response to Blumenaur article, 8/30/04. Partnership with Audubon, Klamath Water Users Association (KWUA), Bureau of Reclamation (BOR), U.S. Fish and Wildlife Service (USFWS), California Waterfowl Association (CWA), Cal-Ore Wetlands and Waterfowl Counsel (CWW), 5/25/04 by KBC (jdk). Go HERE for KBC commentary, transcripts of their speeches, and related fact sheets and media advisories. "He (Eshbaugh) said that his first step in a solution is, 'no lawsuits.' "
Tule Lake Migratory Bird Festival a Success.